Submitted by Sasan (not verified) on Jan. 17, 2018. What would be a decent mic to plug to a phone and record through a phone. I have flstudio installed in my phone and I want have a better quality recording guitar and vocal. Could you please guide me. Thanks. Submitted by Karl White (not verified) on Apr. 13, 2018. I was wondering if i could use a lapelle mic for live band use. My aim is to make more of a show of running round a venue but carrying on vocally singing but wondering about issues of feedback etc. Submitted by Jason Horton on Apr. 23, 2018. That should work just fine - it's common practice in musical theater and I've used wireless lavaliere mics (the technical name for lapel mics) in that context successfully many times. Submitted by Craig (not verified) on Apr. 22, 2018. Hi. I am looking for a mic suggestion for vocals where I picture the mic will be on boom over a large drum with multiple singers sitting around it. I intend to mic the drum with a kick mic on a short stand from below. 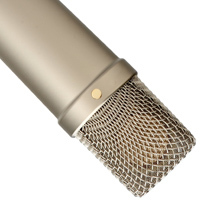 It would be ideal if the vocals mic could somehow reject below it to some extent as the drum can be very loud. The room is big and the speakers are a long way from each drum. But it is a large gymnasium so acoustics are lively. To make matters worse it can't be too expensive (unless you suggest a mic I have lol) . I need to mic 4 groups at the same time.. I do this event only once a year.. and due to cultural protocols there is no money exchanged. ... But I want to do it right so I'm open to any ideas. Right now I have one wireless 58 on a boom stand and a tech moves it from drum to drum between songs. none of the singers are on axis so they sound far away, and the drum is boomy because the mic is too far above it. Any help, is very appreciated. Submitted by Dwayne Oxford (not verified) on Sep. 3, 2018. Which mikes only pick up close (noise cancelling) and which are the ones that pick up everything around? Submitted by Jason Horton on Sep. 4, 2018. Microphones don't use noise cancelling, instead they have different polar patters to determine which directions they pick up sound from. Cardioid mics pick up sound from in front while Omnidirectional mics pick it up from all directions. Submitted by Hans B (not verified) on Nov. 25, 2018. I am really struggling for choice of mic. We have a ukulele group and sing and play. Some of us are comfortable on dynamic mics, not scared off by the sound of our own voice. Others, however, well, a little timid. There are 12 of us (more sometimes) our harmonies are great but we need to be able to pick up the overall sound - not sure what kind of mic would be best, only one or two of the ukes have pickups, so we need to mic up some of the vocals and pretty well all of the ukes. What do you suggest? Submitted by Lucas Moura (not verified) on Nov. 29, 2018. I am looking for professional quality mic for a youtube channel. I would be grateful for any recommendations or suggestions. Submitted by Duncan (not verified) on Dec. 7, 2018. I teach 20 3rd - 5th grade children to play ukulele and sing each year. At the end of the school year the kids give a recital, but without amplification. This year we have money for a microphone -- what is best for a group of this size? Thanks! Submitted by Jason Horton on Dec. 7, 2018. Assuming that you already have a PA System to plug your mics into, then I'd usually go with a pair of Cardiod Condenser mics like these from Samson - but you will have to check with your sound technician first to see if your PA System provides phantom power to operate the mics. If you don't have phantom power then you'll need a couple of dynamic mics. The industry standard is the Shure SM58 however the GLS Audio ES-58-S is a good budget alternative. Submitted by CShaw (not verified) on Jan. 15, 2019. So helpful. I'm running a club at school that will include foley sound work, radio dramas, and podcast interviews. Three setups. Thinking of two sets of lavalier mics for the interviews going into a laptop or possibly a used H1 or H2 Zoom for field work. Unsure what to get for the radio dramas. Limited budget for sure. Any thoughts? Thanks! Submitted by Y J K (not verified) on Jan. 28, 2019. What are the types of mics which are used to record the Foley Sounds? Either inside or outside the studio. Submitted by Alan Pryde (not verified) on Jan. 29, 2019. Submitted by himanshu (not verified) on Feb. 3, 2019. Which type of microphone used for gaming and recording and streaming? Submitted by Karl (not verified) on Feb. 12, 2019. I am looking for miniature Mike that is sensitive enough to pickup heart beat sound. Submitted by Jason Horton on Feb. 21, 2019. Pretty much any microphone that you can place on someone's chest aught to work - for extra sensitivity go for a condenser rather than a dynamic mic.